As the winter snow season revs up, make sure you've got ski boot bags and snowboard boot bags on the checklist for your next winter trip. We've got a bunch of different varieties of ski and snowboard boot and gear bags so you can find exactly what you need - whether it's duffel boot bags, backpack boot bags or wheeled rolling boot bags - we've got it. And don't forget - they make a great Christmas present for the skiers and snowboarders in your life! Ski or Snowboard Boot Bag: this is a souped-up ski or snowboard boot bag designed to carry a pair of snowboard boots and tons of other gear. Its design is the very popular trapezoid style boot bag, which lets you put your boots in the padded outside pockets while leaving the large center compartment open for other gear. One advantage of this style of boot bag is that it keeps your boots isolated from each other and the rest of your gear. This prevents them bumping and scratching things and keeps any moisture they retain out of the main compartment that may house dry gear. Backpack Style Ski or Snowboard Boot Bag: this is one of the best backpack-style boot bags available on the market. 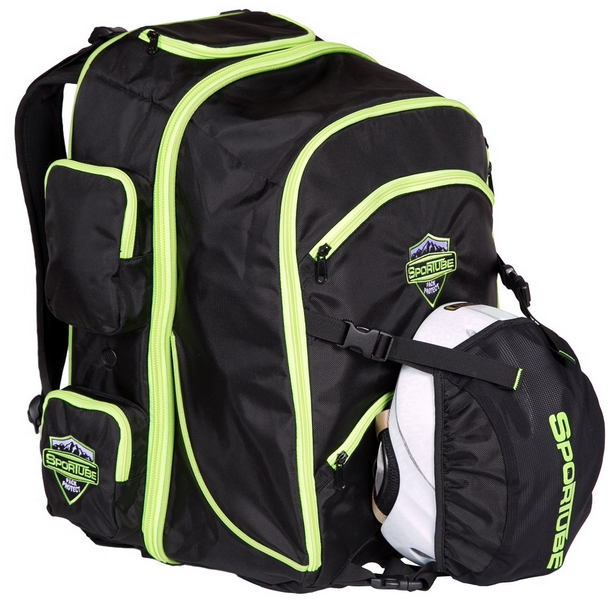 Unlike the popular trapezoid style ski or snowboard boot bags, this backpack style bag is airline carry-on compatible making it a great choice for the traveling skier or snowboarder. While carry-on compatible, this bag is still plenty big enough to carry all of your snowboard outerwear essentials like pants, jacket, gloves, helmet, googles, and of course boots. 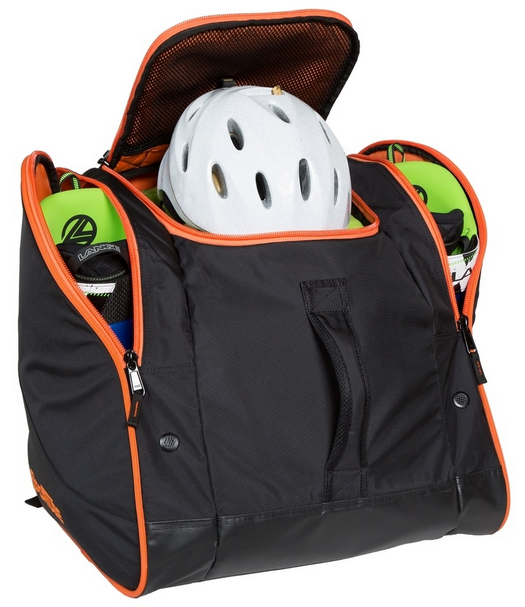 Not only does this bag have ample storage space for all your gear, it also keeps it neatly organized. The key to the organization is the centerfold design which allows you to unzip 3/4 of the way around the bag to open it up like a clamshell. Rolling Carry-On Ski or Snowboard Boot Bag: this is a special boot bag because it is a hybrid that can wheeled around or worn as a backpack. Additionally, the bag is properly sized so that it can be used on U.S. airlines as carry-on! Two inline skate style wheels surrounded by protective corner-mounted housings and stiff bridge keep this bag rolling true. To pull the bag, there is a recessed, telescoping aluminum handle with locking mechanism. 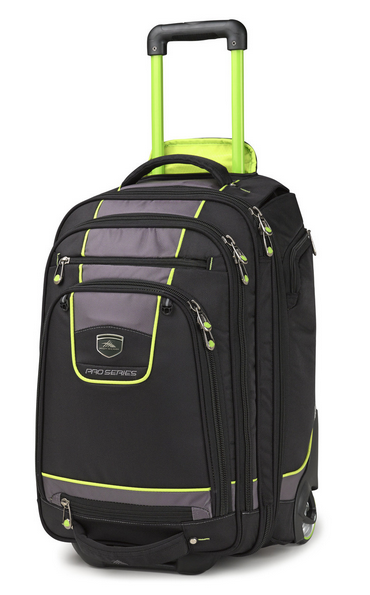 If you want flexibility, capability, and carry-on compatibility all in one bag, then look no further because this is it. Snowboard Art | Display Your Snowboard Deck Art!